‘When was the last time you had a facial?’ Ellie asked as I settled back into the therapy couch in the A.S.APOTHECARY Treatment Room. I mentally scanned back through the months, the years, the decades. I don’t think I’m unusual in thinking of a facial as an unnecessary luxury, something I’d be thrilled to receive as a gift but would be reluctant to pay for. I use A.S.APOTHECARY products on my skin at home, and every few months I might give myself an hour of self-indulgence in the form of a mini DIY skincare ritual. But I think it is a shame that I, like many busy working mums with little time and a budget to work within, find it so hard to put time and cash aside for something that is so nurturing, such a wonderful gift to the self. 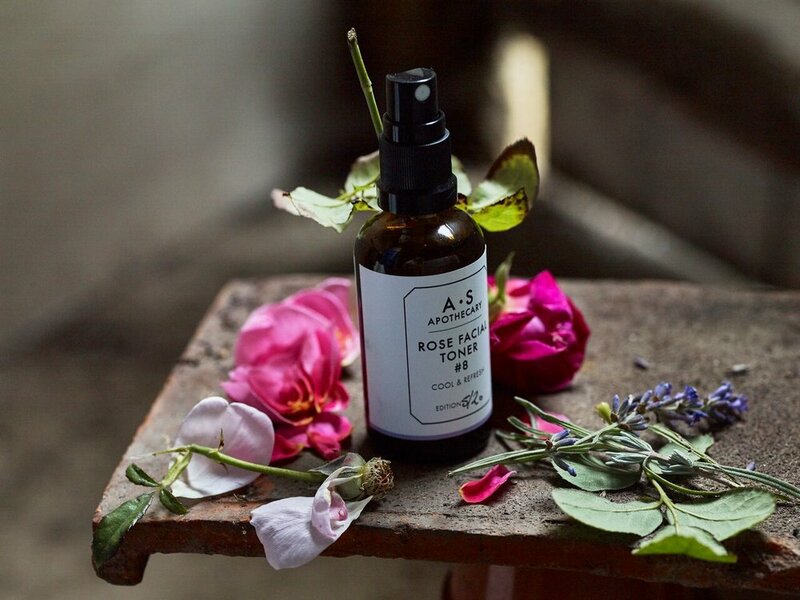 Ellie Gill is a trained green beauty therapist and she has designed the signature A.S.APOTHECARY facial using our products to create a unique and restorative experience. She asked me if I wanted to try her new bespoke facial, which is tailored specifically to mature and peri/menopausal skin. I jumped at the chance. Starting with a deep cleanse, Ellie used the A.S.APOTHECARY Soothing Cleansing Oil #5, which she massaged thoroughly into my skin, then removed with cotton wool pads dipped into hot water. The oil sinks deeply into the skin and gently draws out toxins. It contains Borage, Calendula and Rosehip oils to restore moisture and repair dry skin and Jojoba oil to regulate sebum production and reduce pore size, while Castor oil promotes deep cleansing. After the heat, it was such a delicious sensation to have cool pads soaked in flower water wiped over the cheeks and forehead. Ellie used A.S.APOTHECARY Rose and Geranium Aromatics Waters to tone my skin, both are excellent for hormone regulation. Mixing our Bio Active Mineral Powder with our Cleansing Oil Ellie made an effective exfoliation paste, which she gently applied to the skin in light circular motions. This sloughs off any dead skin so that other products can be absorbed during the treatment. She then wiped it away with a warm flannel. The Mineral Powder draws on Argyll green clay and hand collected Kelp from the isle of Harris plus a selection of our own organically grown flowers and herbs to decongest, brighten and heal, leaving the skin silky and well fed. Next, she covered my face and neck with a thick layer of the Wild Beauty Balm Concentrate as a facemask, which she covered in a warmed sheet of muslin and left for ten minutes to do its magic. This balm is packed with 16 active botanical oils with therapeutics, vitamins, minerals and anti-oxidants to feed, restore, plump and protect and is especially effective for rejuvenating older skin. It includes Pomegranate Seed Oil and Black Seed Oil to prevent UV damage, reduce inflammation and fine lines, Hemp seed oil and Labdanum resin regenerate cells, plump and smooth, Jojoba oil shrinks pores and regulates sebum production, and Pine oil reduces redness and heals . After the muslin was peeled away, Ellie removed the Beauty Balm with a hand crocheted Asapoth cloth dipped in hot water. She then thoroughly spritzed my face with cool Geranium Hormone Balancing Aromatic Water, for a delightful, refreshing contrast of heat and cold to the senses. Using our beautifully scented Intense Repair Facial Serum, Ellie spent time massaging my face and neck using techniques designed to aid the lymphatic system, boost circulation and smooth away tension from the facial muscles. Massage also slows down the signs of ageing and improves suppleness by stimulating the skin, and pulling fresh blood, oxygen and nutrients to the area. Ellie explained how the serum is especially good for brightening and deeply feeding dry or mature skin. It contains rosehip and pumpkin oil, both full of antioxidants and wrinkle reducing properties, also Arnica to heal blemishes and Meadowsweet to condition. Leaving the serum to sink into my skin Ellie massaged my arms and shoulders with our new Body Elixir #33, luxurious, silky and sensuous oil which smells heavenly and is laced with an intense blend of healing botanicals from our own plants and herbs. Finally, to close the treatment, Ellie rolled a cool, Jade roller over my skin which helps remove toxins from beneath the skin’s surface, stimulates lymphatic drainage and removes excess heat, so is excellent for the hot flushes and break outs often symptomatic of menopause. What is so special about Ellie’s treatment is that it’s so much more than just a facial, lasting a whole hour or more, with massage, calming music and the comforting natural perfumes of flowers and herbs in the Asapoth products, it gave me the rare opportunity to thoroughly uncoil. And Ellie has such a tranquil and angelic presence; she is an exceptionally gifted therapist. She created a safe space where I felt able, after a little while, to completely let go and reconnect with something elemental, which is so curative. The nervous system instinctively knows how to relax and heal, we just need to allow time and space to let it. There is also something so intimate and nurturing about having your face massaged, touch is a basic human necessity that we often forget to give ourselves. Apart from the amazing brightness and glow to my skin, I came away feeling grounded and with a real sense of lightness to my being. In the week that followed I really noticed the improvement to my complexion and texture of my skin. To book a facial with Ellie using A.S.APOTHECARY products in our tranquil therapy room please phone the shop 01273 253186 or email hello@elliegill.co.uk , or to discuss a tailored facial call Ellie for a phone consultation.